4,000 of the most common Spanish flashcards and vocabulary words that every Spanish student needs to know are right here in the app and ready for you to study! These pre-made Spanish flashcards are definitely one of the highlights of this Spanish study app. Available for the iPhone and iPad! Using flashcards to study Spanish is the oldest trick in the book. Only now, the technology helps you carry drawers full of Spanish flashcards in the palm of your hand! Study the Spanish you need to know for your next quiz, or the Spanish you want just to speak better! In the Spanish flashcard section of the High School Spanish app, you will find over 4000 vocabulary words that are common to high school Spanish curriculum. In addition to the necessary Spanish nouns, verbs, adverbs, adjectives, we have included idiomatic expressions & useful composition words for you as well. You can study your vocabulary words in either direction: Spanish → English or English → Spanish. Swipe the Spanish flashcard vertically or double tap it to flip it over and see the other language. 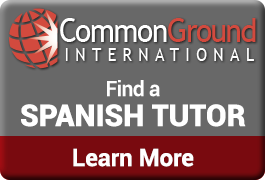 The Spanish 1, Spanish 2, and Spanish 3 flashcard categories include the vocabulary common to those levels of Spanish organized thematically for easy studying. IB, AP Spanish Language & AP Spanish Literature students can work up to the “Advanced” Spanish flashcard categories to test their knowledge and range of higher level Spanish vocabulary. Vocabulary words are always presented randomly to you so that you really learn the word, and not just associate the order of the words you’re memorizing. Once you know a word, you can hide it from your future studies by selecting the green check mark at the top right of your flashcards. “Reset” your Spanish flashcards in the app settings if you like; this will show all cards again. Text to Speech. Press the speaker icon to hear any word pronounced for easier studying. Quizlet integration. Activate the Quizlet In-App purchase ($.99 for a limited time) and you can study ANY flashcards you like from Quizlet.com. You can copy these sets right to your device and they will save in the “My Folders” category of Spanish Flashcards for later study. My Folders. You have a personal flashcard category that you can edit and organize however you like! Most Spanish students use these personal flashcards to study the specific Spanish vocabulary for their upcoming quizzes and tests. Dictionary integration. Search for your vocabulary in the Spanish dictionary and click “Add to Flashcards” and can study that word later. Before you know it, you’ll be on your way to acing your next test! Spanish flashcards are a time-tested tool for individual study. Now you can have thousands of Spanish flashcards in the palm of your hand and study them whenever you want! 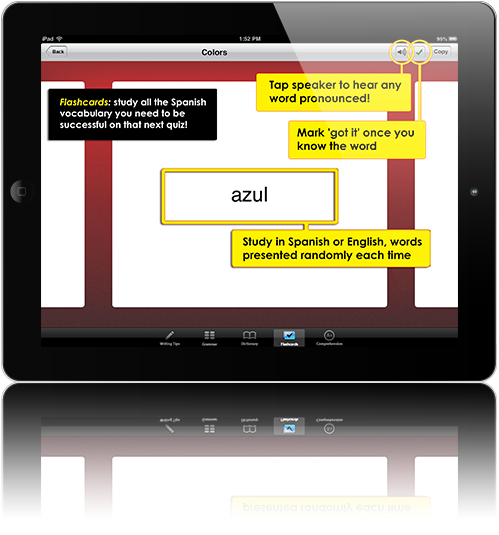 Get the High School Spanish App today and start studying Spanish vocabulary! High School Spanish App – Spanish Teachers LOVE it! What’s new in v1.4 of High School Spanish? The High School Spanish App is built to help you Study Spanish. Regardless of what level of Spanish class you're studying for (AP Spanish Language, Spanish 1, Spanish 2, Spanish 3, Spanish 4, IB Spanish, college Spanish, Spanish immersion classes - whatever! 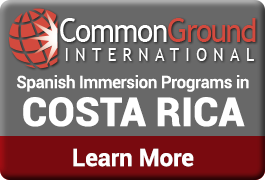 ), Learning Spanish Vocabulary and learning how to speak Spanish are important skills that will help you succeed in your Spanish classes. We built this Spanish mobile app to make learning Spanish easier. Learning Spanish online has value of course, but having a Spanish study app on your mobile device is extremely user-friendly. Have fun and mak great progress learning Spanish with High School Spanish - the best Spanish Dictionary study app available! If you're studying Spanish for specific purposes, we can probably help you study medical Spanish as well!